These days, you can't buy much for a dime. Back in the 19th century, you could get half a pie in New York City restaurants or two tall glasses of beer in Boston saloons with 10 cents, but times have changed - or have they? For a limited time, VUDU is offering up 30 movies in Digital HDX for just 10 cents per rental. Hey, Chromecast owners! 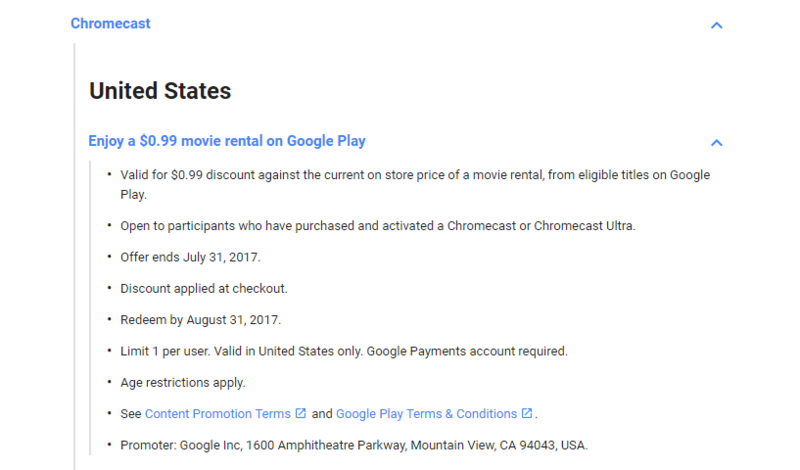 Google has a special promotion going on for you lot — renting any single "eligible" movie from Play Movies will only cost you a measly $0.99. This applies to both the regular Chromecast and the Ultra, but it's unfortunately limited to U.S. residents only. Sorry, internationals. The movie-related deals continue! Google must be paying attention to the forecasts for this weekend in anticipation of ruined family outings. There is a list up on Google Play of 100 different movies, and renting any one of them is just $1 right now with the new promo. If you haven't seen Logan, Arrival, or Get Out, now you can give it a watch on the cheap. And if the kids are starting to go crazy being trapped indoors at grandma's, you can quickly toss up Moana, Finding Dory, or The Incredibles and save yourself for an hour or two. Our cup of holiday discounts runneth over. 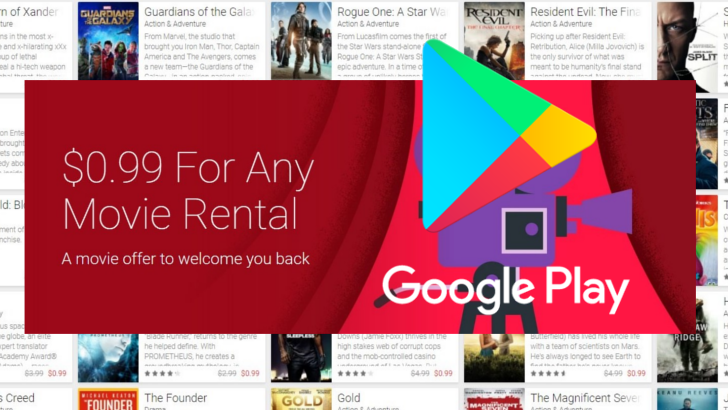 Last week the Google Play Store offered movie rentals for just 99¢ with a promo code (among other discounts). As is its wont, Amazon has now matched that deal with a similar offer on its Amazon Video platform: enter the code "MOVIE99" at checkout and your rental will cost just under a buck. 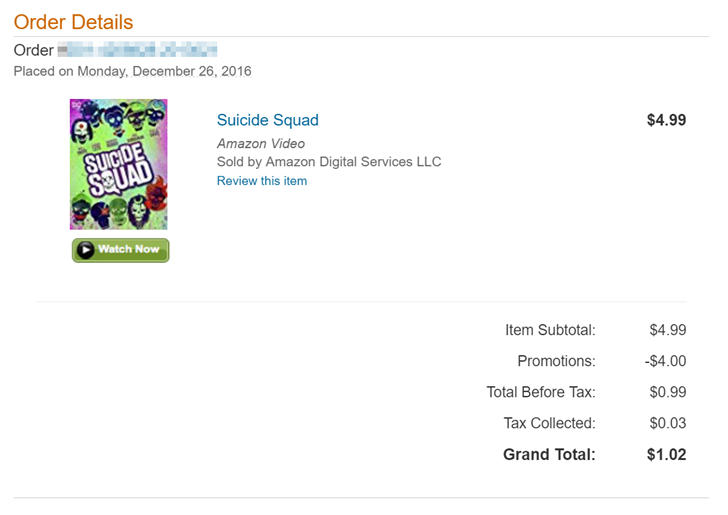 It's good for one (and only one) movie, but there's no reason you can't use both the Google and Amazon discounts for a $2 double feature. Winter has been coming for a long time. Now, as of yesterday, it's finally here. For those of us who live in the northern portion of our planet, that means it's freakin' cold! Here in Seattle it's also super wet, dark, and generally just all around miserable (me and Seattle's weather have a love-hate relationship). In other words, perfect weather to stay in and watch a movie on the couch with a warm cup of cider. Does that sound like a nice idea to you, too? Well, if it does, then read on. Google has two special promotions happening right now, and both of them will lead to a cheaper movie night for you.